The first week of the NFL playoffs are upon us with a pair of games on Saturday January 7th 2017 and another two the following day. All of the matchups were finalized during the final week of the season with a couple of upsets in week 17 affecting the standings. Check out our weekly predictions below to see how each of the eight clubs will fare in the first week of the playoffs. Even though the Oakland Raiders finished the season with a 12-4 record in the AFC West, the same as the Kansas City Chiefs, they dropped to second place in the standings. The Raiders dropped a 24-6 decision in Seattle in their season finale to fall out of first place while Kansas City downed San Diego 37-27 on the road to win the divison. This means the Raiders must now travel to Houston to take o the Texans in the first round of the playoffs at Reliant Stadium. Houston managed to win the AFC South with a 9-7 record even though they lost 24-17 in Tennessee in week 17. The Titans also finished 9-7 in the AFC South division, but failed to make the postseason. The Raider’ top quarterback Derek Carr is sidelined for the playoffs with an injury and backup QB Matt McGloin was hurt against Denver last week. If he’s not ready to play on Saturday then rookie quarterback Connor Cook will likely start in the wildcard contest. Cook has no NFL playoff experience and has just one big league game under his belt, which came last week in Denver. He managed to go 14 for 21 in passing for a total of 150 yards with a touchdown and a pickoff. The good news for Cook if he plays is the fact that the Raiders conceded the fewest sacks this year. The Raiders’ backfield rushed for 120.1 yards a game this season to rank sixth best so that’s another bright spot. 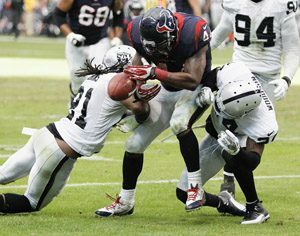 Oakland beat the Texans 27-20 at home back in week 11 with Brock Osweiler playing QB for Houston. However, it looks like Tom Savage could start on Saturday. Savage started at QB from week 15 onwards, but was injured against Tennessee last week, so the starter is up in the air. The Oakland defense allows 257.5 passing yards and 117.6 rushing yards against per week, so could be in trouble. Houston’s a low-scoring team though as their 17.4 points per game ranks 28th in the league. Oakland’s Khalil Mack could be a key player as he recorded 73 tackles and 11 sacks this campaign. The Raiders are 7-3 in their past 10 road outings while Houston is 8-2 in their past 10 home encounters. The Texans defence allowed 301.3 yards per game this year which actually ranked first in the league. The Lions lost their last game of the season 31-24 at home to Green Bay which meant the Packers won the NFC North with their 10-6 record while Detroit came in second at 9-7. This means the Lions have a trip to CenturyLink Field in Seattle this Saturday with the Seahawks being the favourites. The Seahawks beat San Francisco 25-23 in their final outing last week and finished the campaign on top of the NFC West at 10-5-1. Detroit enters the game with three straight losses to end the season. The Lions came back seven times in the fourth quarter this year to win games, but their luck could run out sooner or later if they fall behind in Seattle. The Detroit passing defence was the league’s worst this campaign by allowing 248.4 yards against per game. In addition, quarterback Matthew Stafford dislocated a finger in week 14 and has been struggling since then with five interceptions and just three touchdowns to his name. He had a good game against Green Bay though with 347 yards in the air, but will need help with big games from Marvin Jones and Golden Tate. They’ll be facing a Seattle secondary which will be missing safety Earl Thomas. He will be a big loss for the Seahawks and the team will also be without receiver Tyler Lockett due to a broken leg. The Seattle ground attack may also struggle with an untested rookie in Alex Collins and a banged-up Thomas Rawls. Quarterback Russell Wilson could do some major damage in the air though and that may be the difference in the game. Wilson struggled against San Francisco last week though after having a fine outing against Arizona a week earlier with four touchdown passes and 350 yards. Seattle beat Detroit 13-10 at home last year with Wilson passing for 287 yards and connecting on 77 per cent of his attempts. Seattle has won six postseason games in a row at home and was 7-1 at CenturyLink Field this year. The Steelers managed to down Cleveland 27-24 at home in overtime last week to finish the season at 11-5 and win the AFC North. Meanwhile, Miami was beaten at hoe 35-14 by New England. The Dolphins went 10-6 on the year and finished in second place in the AFC East. The Steelers are favoured to win at home at Heinz Field this Sunday even though the Dolphins had a good season with head coach Adam Gase at the helm. Miami started the year at 1-4, but then caught fire and went 9-2 the rest of the way. Miami is basically an average team though with a 14th-ranked offence and 19th-ranked defence. Gase was able to get the most out of his squad this season though, especially offensively, as Miami averaged 26.1 points a contest between week 6 and week 16. Miami also managed to beat the Steelers during the regular season with a 30-15 victory at home on October 16th. Jay Ajayi had an excellent outing in that clash with 25 carries for 204 yards and a pair of touchdowns and the running back will be depended on for another big game this weekend. Regular starting quarterback Ryan Tannehill was replaced by Matt Moore after he was injured an and Moore has started three games with eight touchdowns, three interceptions and a pass-completion rate of 63 per cent. The Steelers have won seven straight games with a dew of them being come-from-behind affairs. Their key players are quarterback Ben Roethlisberger along with Antonio Brown and Le’Veon Bell and they were all rested against Cleveland last week. Bell struggled against Miami earlier this season with only 53 yards on the ground, but Miami’s rushing defence isn’t the greatest as it’s ranked 30th by allowing 140.44 yards against per game. Roethlisberger has been inconsistent lately with six interceptions in the past six games. Pittsburgh has won four of their past five home playoff games, but was beaten in their last outing by Baltimore in 2014. Green Bay managed to clinch the NFC North on the last day of the season with their 31-24 road win over second-place Detroit. The Packers finished the year at 10-6. Meanwhile, the Giants knocked Washington out of the postseason with a 19-10 road victory in their season finale. New York finished the campaign in second place in the NFC East at 11-5 and are the underdogs heading to Lambeau Field in Green Bay this Sunday. This is the Giants’ first appearance in the postseason in four years and they finished the season by going 8-2 in their last 10 contests. These two teams met on October 9th with Green Bay winning 23-16 at home. Even though Giants’ head coach Ben McAdoo is offence-minded the team’s defence also did a fine job and led the league takeaways since week 7 with 21. The Giants conceded just 17.8 points against per game which was the second-lowest mark in the league next to New England’s 15.6. New York allowed a maximum of 10 points against in three of their last four outings. They ranked 15th in the league in sacks and seventh in interceptions. New York scored 26 aerial touchdowns this season and averaged 251.7 yards per game in passing. This could be a problem for the home team since Green Bay allowed the second-most passing yards this season at 268.6 yards per outing. Expect the Giants to use an aerial attack since they average just 3.5 yards per rush. The Giants went 4-4 on the road this year. Green Bay is riding a six-game winning streak and have now won their division five times in the past six seasons. Quarterback Aaron Rodgers was hot over the past seven weeks by throwing for 18 touchdowns without being picked off once and averaging 288 yards a game. Green Bay scored 40 touchdowns in the air this year and their 27 points per game was the fourth-most in the league. Green Bay’s ground game ranks 20th in the league at 106.3 yards a game so expect Rodgers to be throwing the ball, especially against a fine Giants’ rushing defence. Rodgers has some good receivers to work with such as Jordy Nelson and Davante Adams. The Packers’ defence needs to be better though, especially when it comes to passing. Their passing defence allowed 4,308 yards against this season, which was second-worst in the NFL. This means Giants’ quarterback Manning will try to take advantage of it by throwing to Odell Beckham. Green Bay went 6-2 at Lambeau Field in the 2016/17 campaign.